The Trade Unionist and Socialist Coalition (TUSC) today launched a new report on the level of reserves held by Labour-led councils across Britain, arguing that "the substantial resources of the local state under the control of the Labour Party" could be used to start putting Jeremy Corbyn's anti-austerity policies into action now, "without waiting for a change of government". "One of the most outrageous aspects of the Grenfell fire disaster was the fact that Kensington & Chelsea council slashed safety standards to 'save' money while they were sitting on Â£274 million in usable reserves. "Fire-resistant zinc cladding in the original 2012 refurbishment plans was replaced in 2014 with cheaper aluminium panels to save Â£293,368 - equivalent to 0.1% of the council's current reserves! Shadow chancellor John McDonnell is right to say, this was social murder. "But Kensington & Chelsea is not the only council to put maintaining its reserves ahead of spending on vital needs. And housing is not the only area of local public services where this is happening. "The election result makes it clear that the Tories do not have a mandate for continued attacks on public services and should be the signal for Labour-led councils to change course and call an immediate halt to cuts to local public services. "The new TUSC report giving a statistical profile of all 124 Labour-led councils in Britain, entitled How much reserves have they got?, shows what a counter-power to Theresa May's 'weak and wobbly' government they could be, if they were prepared to implement Jeremy Corbyn's anti-austerity policies. "Labour's radical general election manifesto said 'a Labour government will give local government Â£1.5 billion of extra funding for next year (2018/19)' for immediate relief from austerity (from Funding Britain's Future, page 4). Our report shows that Labour councils, with combined general fund usable reserves of Â£9.2 billion and Â£4.3 billion in housing and capital usable reserves, could spend that amount now to avoid cuts - without waiting for a change of government. "The report's introduction points out that the Labour councils' combined spending power is greater than the total state budgets of 16 EU member states! If Labour-led councils declared that they will use their borrowing powers and reserves to stop all cuts - in the expectation that they would be reimbursed by a future Labour government which may be just months away - what could the Tories do?" "Our union's annual general meeting (annual conference) re-affirmed our complete opposition to austerity policies, including their impact on local councils and the essential public services they provide. "We passed a motion supporting a campaign for local authorities to use their reserves and borrowing powers to set legal 'No Cuts Budgets' that protect public services and jobs, while campaigning for more resources from the government. "The TUSC report shows that councils can take that road and we urge them to do so". Dave Nellist concluded: "We have a chance to show what Jeremy Corbyn's anti-austerity policies could mean in practise if Labour councillors refused to vote for cuts in the council chambers. 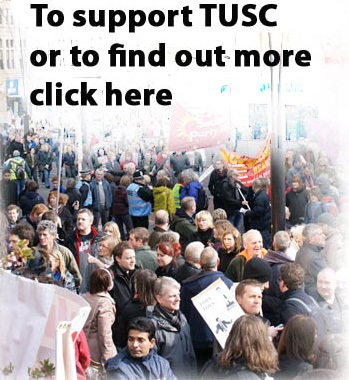 "This TUSC report will be a powerful tool in the fight to make that happen".